t*rexes and tiaras: Friday Favourites 133..
001: Argh, really what I need to do is avoid all shops, because everytime I browse, I end up seeing something I cannot-possibly-live-without. How can one be expected not to spend money when this absolute beauty of a coat is being released soon by Tara Starlet. Due in the next couple of weeks, apparently. As a self-confessed coataholic, I may have to sell my own soul for this one. Lovely post, the coat is so cute!! I know, right - damn spending ban. 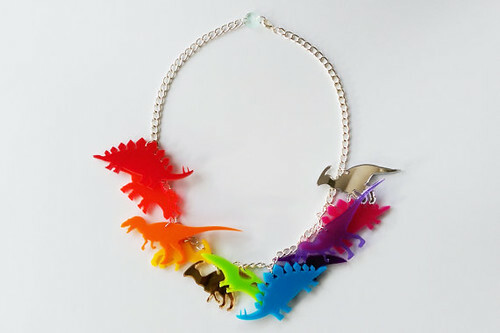 That dinosaur necklace is the absolute business! Love the heart shaped pockets on the coat. I've always fancied putting heart shaped pockets on a dress or skirt. They look so cute, right? I'd bookmarked a similar Orla Kiely jacket with heart-shaped pockets. That coat is seriously AMAZING! Argh see this is why I couldn't go on a cold turkey no buy, I'd feel like the world was ending if I missed out on stuff I really liked! That coat is adorable, I love the heart pockets and could totally see you in it (not to rub it in). Have you noticed that your bank account is a LOT healthier already though? Waaah. I'm asking my mother for it for my birthday, so I'm going to cross my fingers even though it's a couple of months away.